From left to right, South Sudanese refugee Thomas Wani, his brother Peter Lemi, his mother Rose Sunday and his father Julius Lezu enter Uganda at the Busia crossing, near Kuluba, northern Uganda, June 8, 2017 (AP photo by Ben Curtis). 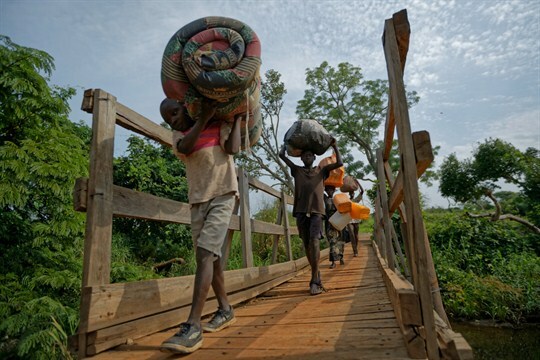 The international community has long lauded Uganda for its response to the massive influx of South Sudanese refugees who have fled across the border since the start of that country’s conflict in 2013. As the number of arrivals climbed into the hundreds of thousands, Kampala maintained an open-door policy and committed increasing amounts of land for agencies to construct temporary settlements and for refugees to build permanent shelters. The country opened up its schools and health clinics to the new arrivals. At a time when other countries around the world were taking steps to prevent asylum-seekers from even reaching their borders, Uganda was held up as an exemplar of humanitarianism.